Parishes in three regions of the Philadelphia Archdiocese will continue discussions this fall that will lead to more sharing of resources among the parishes, but may also result in mergers, the archdiocese announced Sunday, May 3. A total of 14 parishes in Delaware County’s Springfield Township, the Port Richmond section of Philadelphia and a swath of eastern Montgomery County had begun the archdiocese’s pastoral planning process last October. After months of discussion and study among leaders and members of the parishes, plus the Archdiocesan Strategic Planning Committee, recommendations for the parishes were made to Archbishop Charles Chaput. The decisions he announced this week address a range of options for the parishes that will extend the planning process into this fall. 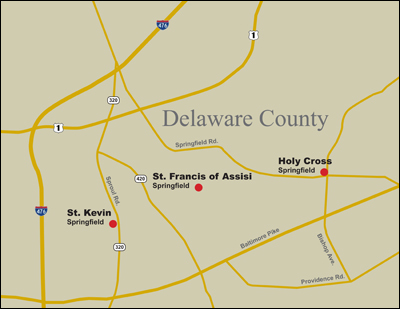 In Springfield’s Parish Planning Area (PPA) 330, the three parishes of St. Kevin, Holy Cross and St. Francis of Assisi will remain open but will need to “address the financial challenges the parishes face,” the archdiocesan statement said. The parishes, through a Parish Planning Committee, face a July 1 deadline to detail specific steps to strengthen finances and determine ways the parishes can collaborate, plus a timeline for implementing the steps. By December the committee will need to report on the parishes’ progress. Of the six parishes in a region of Philadelphia’s Port Richmond section, only St. Anne Parish is unaffected in the new announcement of planning. The only other territorial parish in the region (PPA 570) is Nativity B.V.M., and within a several block area the parish is joined by four other personal parishes serving various traditional ethnic groups. 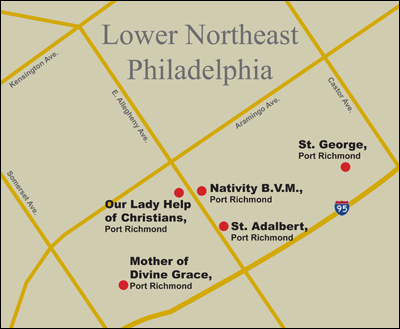 St. George (Lithuanian), Mother of Divine Grace (Italian), Our Lady Help of Christians (German) and St. Adalbert (Polish) have long seen their congregations dwindle as the river ward neighborhoods have changed over the years. Adding to the diminished Catholic presence and practice in the area is the churches’ large physical structures and their costly maintenance needs. The three churches of OLHC, Nativity and Adalbert’s dominate the view of the neighborhood from I-95 not only because of their alignment on Allegheny Avenue within two to three blocks of one another, but because their massive size and ornate beauty would qualify them as cathedrals in any other part of the world. Last October the five parishes were asked to consider merging into two or three parishes. The complex combination of declining church attendance, maintenance costs and “serious financial difficulties in several of the parishes” did not “allow for a simple solution,” the archdiocese’s statement said, and no consensus was reached on a decision. Therefore Archbishop Chaput decided the parishes should continue the study process this fall specifically to share “pastoral ministry and resources,” while the Strategic Planning Committee looks at how the parishes can collaborate formally. Montgomery County’s PPA 470 stretches from the Northwest Philadelphia border north up to the Bucks County line, encompassing boroughs such as Ambler and Oreland, plus more sprawling areas such as Maple Glen and Horsham. 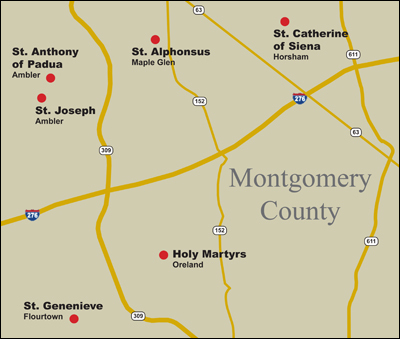 The six parishes of Holy Martyrs (Oreland), St. Genevieve, (Flourtown), St. Alphonsus (Maple Glen), St. Catherine of Siena (Horsham) and St. Anthony of Padua and St. Joseph, both in Ambler, sought in planning last fall to consolidate into four parishes. The archbishop agreed with their assessment that they were strong enough to remain open and independent, as all “currently appear to be financially and pastorally viable,” the statement said. The archbishop’s decision called for the two Ambler parishes to explore ways to “cooperate in some areas of ministry,” and for Holy Martyrs and St. Genevieve’s to do the same. Meanwhile, the Strategic Planning Committee would again seek ways for better collaboration among the parishes of that area. The archdiocese’s pastoral planning process to strengthen parish life began in 2010. In the past three years of announced mergers, the number of parishes has reduced to the current 219 from 257 in 2012. The archdiocese expects to announce more parishes will begin the planning process this fall with recommendations anticipated for spring of 2016. It makes lot of sense for parishes close to one another to work together. They can share Adult Faith Formation sessions, coordinate mass times & confession times (so there are more time options), etc.